I have probably received more email regarding this web page than any other single page we have posted. (Original write up starts below, as Opus 1.) Most of the comments fit into the category of "You are NUTS for carrying such a huge pack. Why do you carry all that heavy gear??" And those are just the comments from normal backpackers. You should see some of the comments from the Ultra-light gear types. My general responses typically focused on comfort (I really don't like being cold, and I love my Crazy Creek Chair) and safety (being out on the Continental Divide in a major storm sitting in a two pound tent is too thin a safety margin for me). Also, I guess at the back of my mind, there was the concept that carrying all that weight was good conditioning. Some people might call it "debilitating." As they say, desperate times call for desperate measures. So faced with the recent diagnosis of a torn meniscus in my left knee AND a week long canyon trip less than three weeks away, I knew I had to do something to lighten my load. Substantially. I started looking at my old gear list, and realized that over the past few years, I HAD been doing things to lighten my load. We had gone to a lighter weight backpacking stove, and both of us had moved to Marmot Precip rain gear. While not as sturdy as the heavier, multi-layer Goretex suits, they work, as long as you are not going through brush. But there, in the corner, stood my beloved 1997 version (the date is important) of the Gregory Denali Pro. All 9.5 pounds of it, including the two external pockets I had attached for easier access to gear one needs during the day. Yes, it looks like it was built to withstand World War III. And yes, it has the most comfortable suspension system I had ever used in a pack. Yes, it had wonderful inside dividers, and all sorts of lash points. And yes, it really did weigh 9.5 pounds. Now, truth be told, I had been looking at new packs for some time. I figured the minium volume I could tolerate was 6000 cubic inches. I wanted a pack that had a wonderful suspension system, weighed no more than 5 pounds, and could easily pack that sort of volume. Well, here is a news flash: such an animal does not exist (At least as of spring, 2006, it did not). And perhaps, such is not surprising. To hold that much volume, you need heavier fabric, and a very sturdy suspension system. Not the sorts of things one finds in a five pound pack. 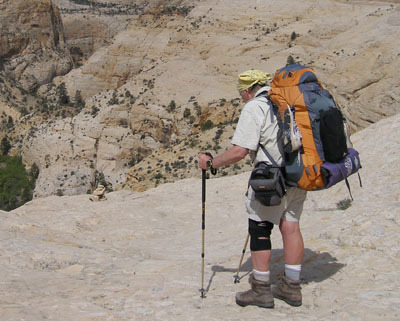 But then, my good friend Will, who is getting older at exactly the same rate at which I am, and who was planning on joining us on the upcoming canyon trip, asked me what I thought about the Osprey Aether 85 backpack. I looked up the specs (it is supposed to hold 5400 cubic inches and weigh about 5 pounds) and decided it was time to quit screwing around and get one. Even after adding an extra pocket on the back of the pack, 4 pounds is a lot of weight to save in one's backpack. Since this is not a specific gear review, I won't go into a lot of detail on the pack, but nevertheless, just a few impressions. It fits OK, and the hip pads, even with a load of 50 pounds or so, feel pretty comfortable. The hip pads cup your hips at both top and bottom, which makes a big difference in weight transfer. The saving feature of the pack, in terms of volume and space, is the stretchy large pocket on the back of the pack. I don't think it will stand a lot of abuse (I just don't see this pack surviving many drags or lowerings over a hundred foot of slickrock) but it is convenient. And roomy enough to stuff both top and bottoms of rain suit, a pack cover and a wind shirt. With the volume of gear I carry, loading in a week's worth of food on a cold weather trip is going to be a stretch. However, in general, I would give it moderately high marks. However, as I have lost weight, I have had to purchase a new, smaller hip belt (I no longer have enough waist around which to fully tighten the original hip belt. And frankly, I have less of a shelf on which to hang the hip belt. The last time I wore it on a backpack, it was not very comfortable. I may go back to my Gregory Denali Pro. Living now in what I understand to be the Mecca of ultralight backpacking, Bozeman, Montana, I guess I feel compelled to make a few comments about ultralight gear, packing etc. Even someone who is not very astute when it comes to these matters can look at my revised gear list and determine that I really have not gotten with the program in terms of going light. While I consider whittling down my final pack-carrying weight to something near 50 pounds to be a major achievement, it is nothing quite like the list I recently ran across that claimed 27 total pounds, including food and fuel, for a 7 day (ok, in the fine print, he admits that it is only 6 full days) backpack. Clothing: in these lists, I can never glean any extra clothing in them. Like, what do these people do at the end of the day after they bathe? Change into their dirty clothing, or wet, recently trail-laundered clothing? (He can't really be laundering any clothing: I saw no soap or shampoo or trail suds on this 27 pound list) Or maybe they just wear the same clothing day in and day out. (I have noticed that these lists are usually built around solo hiking. Maybe there is a reason for the solo part. No deodorant was listed either.) Spending an entire week dirty, sweaty, and stinky is not what I consider a vacation. I recall that for the five days I was "on the mountain" with Ranier Mountaineering, attempting what was ultimately a successful summit, I did not bathe at all. I vowed: "Never again." Shelter: I once got into a long and interesting email exchange with a woman who had seriously gotten into ultralight backpacking. She pointed me to a friend's web site on a recent winter trip in the Beartooths. Most of the photos were captioned more like a fashion show: "Here is Tim sporting his new Ultrafuzz pile jacket, that only weighs 2.74 oz" But I was really taken by their camping photos. Here they were in the Beartooths, in Montana, in the winter, in tents with no floors, looking like a hard sneeze from the biggest guy on the trip would blow them into the next state. It may be ultralight, but it also seemed ultra-foolhardy to me. Maybe I am just too conservative. Tents without floors have never been appealing to me: too many things like snakes, scorpions, and mice can find their way in. Susie and I have been looking for a good tent that would be what I call a 3+ season tent for some time now. 3+ is what you might run into hiking along the Continental Divide trail in Late September in Colorado's Weminuche Wilderness. Yeah, it was September, but the howling, gale force winds, rain, sleet, snow and hail, along with a frozen tarp sure gave it a sense of winter. Anyway, the tent that seemed to meet our needs was the Sierra Designs Hyperlight AST 3. A great tent, but it is no longer made. However, the design features are worth discussing, and considering. It is supposed to be a three person tent, but we are not sure where that third person would go. But the tent is roomy, has two doors and two small vestibules, and has a fair amount of room for gear. And while it has only two main poles, the so-called Jakes Corner has an amazing stabilizing force to it. Just what you need for one of those stormy afternoons when you get into camp early. The tent is claimed to weigh 5 pounds 10 oz (see my tent weight comments below) but by the time you seal a couple of seams that need additional attention, add a couple of extra stakes, and throw it a real ground cloth, the tent was up to 7 pounds 2 oz. Still not bad for a very roomy 3+ season tent. But we have since moved on to the Big Agnes Fly Creek UL3. It weighs perhaps 4.5 pounds, but it feels like gossamer. We have not had it out yet in a real blow. Cooking gear: No cups (maybe he is better at eyeball measuring than I am) and only a 0.9 liter cooking pot. Such means you have to heat water in the same pot you just cooked Hamburger Helper Lasagna in. I know, the lasagna gives your evening cocoa a distinctly European flavor. Of course, I have watched a lot of my friends cook meals in the backcountry, and frankly, they did not sound all that appealing. I mean: pouch tuna fish with shrimp ramen noodles?? Hey, what ever floats your boat. For me, two pots, even two small ones, make all the difference in the world. Besides, if you have a traveling companion, you can each use a pot at the end of the day for bathing and laundry. And I noted that an insulated mug was listed as an extra. Well, maybe it is extra if you hike all the time in 70 degree weather. But on a frosty morning, putting coffee in an open metal or standard plastic cup is not very appealing. 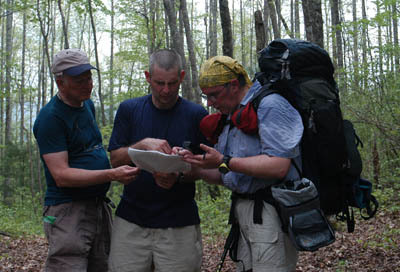 Navigation: Forget the monocular, and replace it with something useful, like a small GPS. Maps? At 0.2 oz apiece?? Well, maybe if you spend your week hiking in circles over a very small area. What does he print his maps on? Tissue paper?? For me, maps are all about context. I print mine on 13" x 19" sheets of paper. Each weighs about an ounce or so. And I do copy hiking guide descriptions double sided, but each three sheets of paper weigh an ounce. Also, for safety, I now always carry a large overview map. Twice in the last seven years, we have had to abort a long trip and exit via a totally different route. Thinking "safety" compels me to carry a map with escape routes on it. And because they are larger and represent overviews, they are heavier. Toilet paper: I get a kick out of this: 1.5 oz for a week long trip?? He did not mention taking a load of Immodium AD or Lomotil before the trip, but that is the only way I could imagine getting through a week of hiking on just a couple of oz of TP. And speaking of personal stuff, in addition to no mention of deodorant and hand soap, there was minimal aspirin, ibuprofen, or any sort of drugs. Maybe the folks that pack ultralight are made of steel and don't sweat. And two?? Immodium AD caplets? My experience is that if you need them, you are likely to need more than two. Camera equipment: for the aforementioned trip, I really paired down my gear. In the years since I developed the original list, I have gone completely digital. I carry a Canon SX40 Point and shoot with a zoom lens that goes from a 35 mm equivalent of 24 mm focal length out to 840 mm. With a spare battery, UV filter, and several memory cards, the entire package, including the carrying case, weighs a bit over 1.5 pounds. Yes, you can buy smaller, lighter weight digital cameras, but the system I carry affords the opportunity to mount a polarizing filer on the lens, which is nice for landscape shots. And the long telephoto gives one the ability to take photos of wildlife. In the 27 pound list, I saw no camera equipment. Maybe if you hike around in circles using really tiny maps, you see the same thing enough to remember it for the rest of your life. The Bottom Line: My general sense of many of the ultralight gear lists I see is that a) they are simply not complete (no soap, deodorant, no camera gear, no water bag, etc); b) they offer few amenities; and c) they clearly do not offer the level or protection that I think one needs in places like the Northern Rockies (eg. minimal tent, no bear spray in grizzly country, poor navigational support, little extra clothing, no ankle wrap or Sam Splint in first aid kit). Maybe when you pack ultralight, you can speed hike out to the nearest pizza place when the going gets too rough. Now THAT crack really ought to increase the email responses to this page. 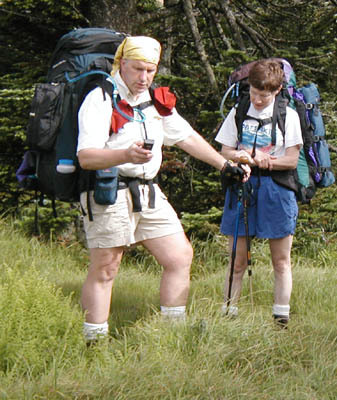 Perhaps a more reasonable (in my opinion) lightweight backpacking gear list can be found here. "Wired" takes her long distance hiking very seriously, and carries in electronics what I carry in photo equipment. I still want a few more amenities, but maybe it is time to start looking hard at pairing things down a bit. Over the years, a lot of people have asked me about the sort of gear I take on backpacking trips, especially those involving several nights out in climates considerably different than those experienced in Eastern Tennessee, where we live. Others have asked, upon seeing my pack, somewhat incredulously, "What EXACTLY do you have in that beast??!!" So maybe it is time to reveal the mysterious contents of this second being riding my back down the trail. If you want to cut out all the comments, you can download the gear list either as a PDF or an Excel spreadsheet. However, the comments should be what make it all worth reading. 1. So when you download the list, you might first notice that there is no food listed. That's because this is about gear, not food. Trail food is something to which we are going to devote a new section of this web site, once we get a bit more time. But suffice it to say that together, Susie and I have found the Holy Grail of backpacking food, at least in terms of weight. By paying attention, and having aged-decreased trail appetites, we have been able to reduce our food weight to 24 oz per person per day. That means that for an 8-day, 7 night trip, we are typically in the range of 22.5 - 24 pounds of food. Susie typically carries 10 - 11 pounds and I carry the rest. 2. You should also realize that the weights, especially for clothing, are going to depend on how big one is. For example, I am typically twice Susie's dripping wet weight, so the exact model of Polartec pullover for me will weigh considerably more than hers. 3. Tents and their various strengths and limitations could occupy several pages of discussions here. I have listed the tent that has been our Western Mountain standby for years: the ORIGINAL Sierra Designs Lookout (1992 vintage). Note that it is not the Version 2.0 (god, now everyone has got to make gear sound like software, to make it high tech sounding), with the ridiculous zippered door in the ceiling?! of the tent fly, or two exit doors, and two equally small vestibules - where one larger one would weigh the same and offer some practical space. We have several other Sierra Designs Tents. They are great systems, but I have noted a trend in the tent industry to add a lot of crap that adds weight without concomitant increase in functionality. Once a tent to be carried by a couple of people starts to exceed 8 pounds or so, there'd better be a darn good reason why the manufacturer is adding an extra 8 oz. 4. Which brings me to tent weights. Look very skeptically at the weights reported on web sites, or catalogs. They may be good within a given tent line or manufacturer for assessing RELATIVE weights, but if you think that is the weight of the object you will actually throw on your back and carry, you are living in a dream world. "Oh, so you want to carry stakes with that??" 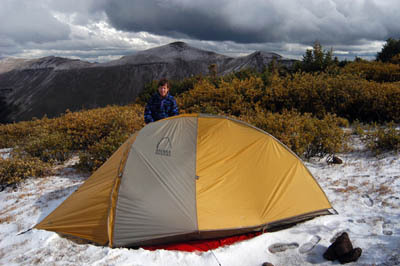 Like, I am going to carry a dome tent above timberline in the Sierras and NOT carry stakes? Believe me, if you think you might need a dome tent to shed wind, I can assure you want to carry stakes. You will also need to seam seal the tent (After some wet nights using brand X seam sealer, I now swear by Seam Grip. Yes, it is expensive (five to six bucks a tube and you may use 3 or 4 to do a thorough job) and yes, it adds precious ounces, but in a Smoky Mountain rain, I can assure you the peace of mind and dry gear is worth every penny you paid and every ounce you carried.) You will need to make sure you have a couple of pull out cords and extra stakes to tie the tent down in a blow, and you will need to get a ground cloth. We like to use uncoated rip stop nylon. Our buddy George swears by a sheet of plastic with holes punched in it so that the inevitable rain that gets under the tent can drain away. With George being an engineer and me a chemist, the discussion as to the relative merits of the two approaches has consumed hours of time around the campfire. We have agreed to disagree, but clearly, either approach works pretty well. So the bottom line to all of this that it is easy to add another 16 - 24 oz to the real weight of a tent, by the time you actually get it out on the trail. Make sure you know what you are up against before you throw it in your pack. 5. If you look at the list carefully, you will see that the heaviest thing on there is the weight of the pack itself. I carry a Gregory Denali Pro with two extra outside pockets. Yes, it is heavy, but it is really comfortable. I have modified the main buckle, replacing it with a Kelty Cam lok buckle (you can find Kelty parts in backpacking shops). I think it holds the waist band tighter. There are vastly lighter weight packs out there. The extreme end is the GoLight series of packs. Yes, they look like they can hold at least 25 pounds before they fall apart of the stress of the load. They may work fine if you are out for a perfect weather weekend, and you have someone else to carry most of your gear. But it is hard for me to imagine these super light packs dangling on the end of 50 feet of Goldline haul rope being tugged up over slickrock and lasting very long. 6. Full disclosure here: I do not carry all of this gear myself. Susie does carry some of the community gear (usually the stove and 1 liter fuel bottle). But she is half my weight and carries more than her share of the food. I am happy to be the pack horse. Just don't expect me to be a speedy hiker. If you look over the list, I am sure you can figure out ways to lighten your load. There is a lot of camera equipment, and no, I have not listed some of the weights of things I carry in my hand as I hike. They don't count, right? It is only what is on your back that counts. Safety in the backcountry is of paramount importance, and that is why we carry good rain gear and good shelters. Comfort is also important, so I indulge myself in the Crazy Creek chair. It makes all the difference in the world when you get into camp. I have talked to backpackers on the trail that were sporting 30 pound packs, and was envious, until I considered what they were giving up to have a light load. Hunkering under some plastic tarp in a rain storm, on a quarter inch thick foam pad and eating Power Bars for dinner instead of a hot meal to save weight on your back is not the kind of misery I want to put myself through.